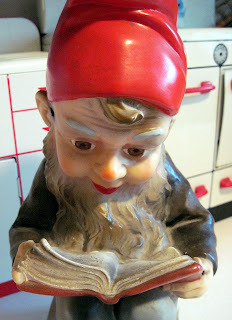 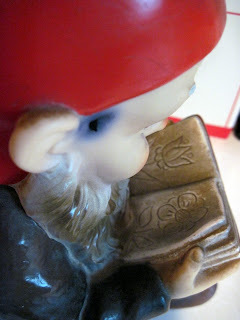 This month's gnome-a-thon wraps up with a character from Steiff: "Pucki," one of their small gnome figures, made in Germany in the late 1940s-early '50s. 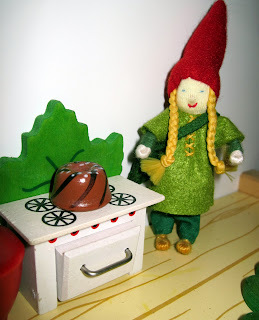 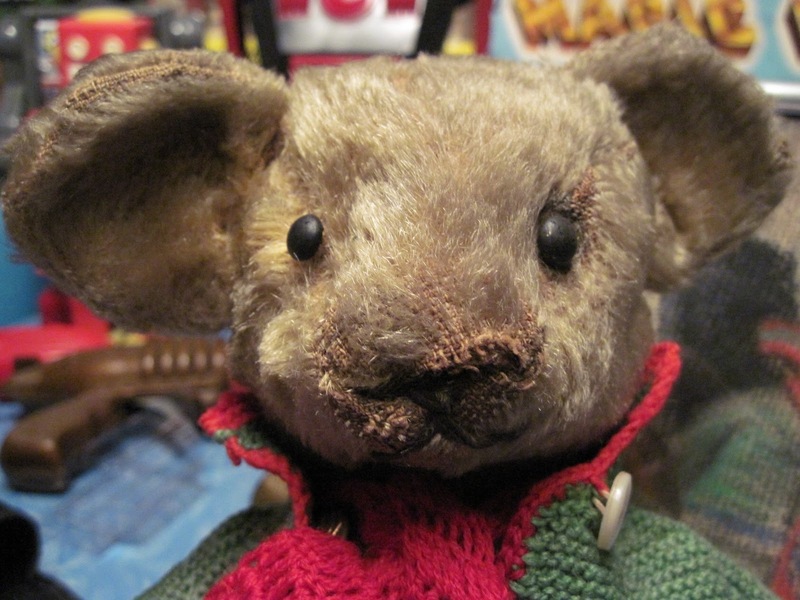 Pucki is 5 inches tall to the top of his hat, and is made of a rubbery composition material over a wire frame, with felt clothing and a mohair beard. The rubber compo material tends to deteriorate over time, resulting in drying, stiffening, cracking, and breaking. 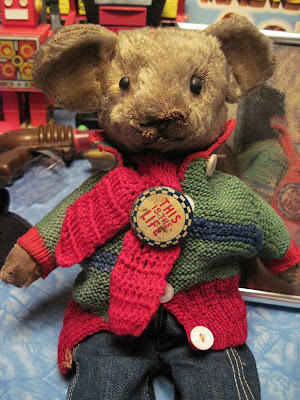 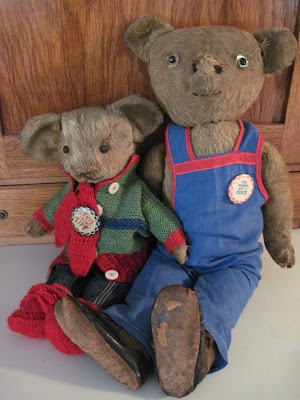 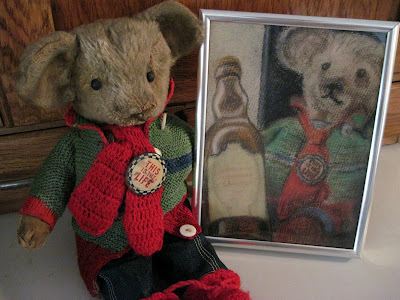 Steiff made many similar gnomes around this time period, and even with their condition issues, they're still charming little guys. 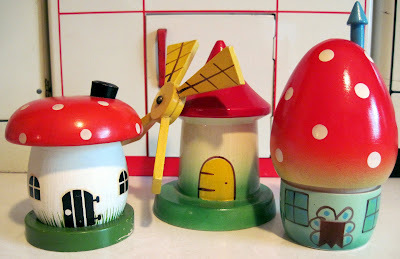 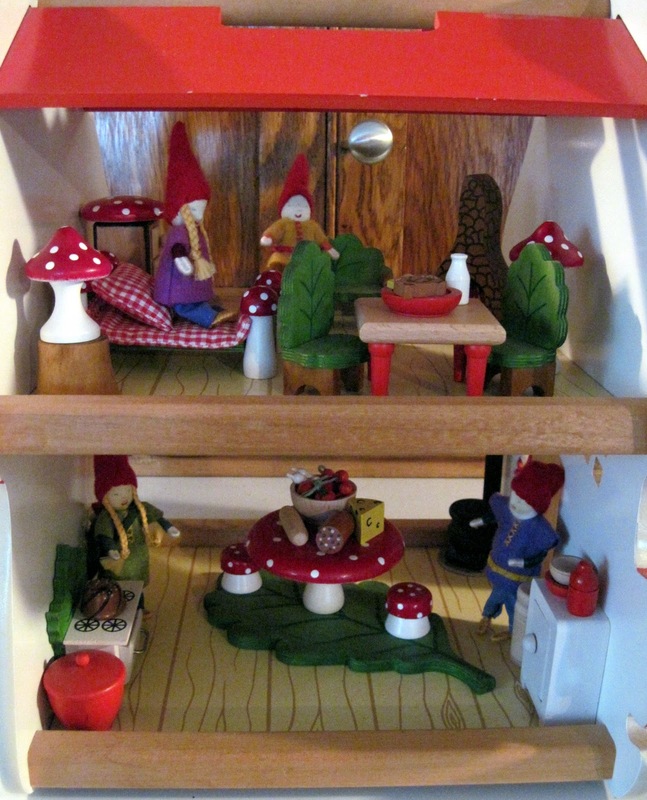 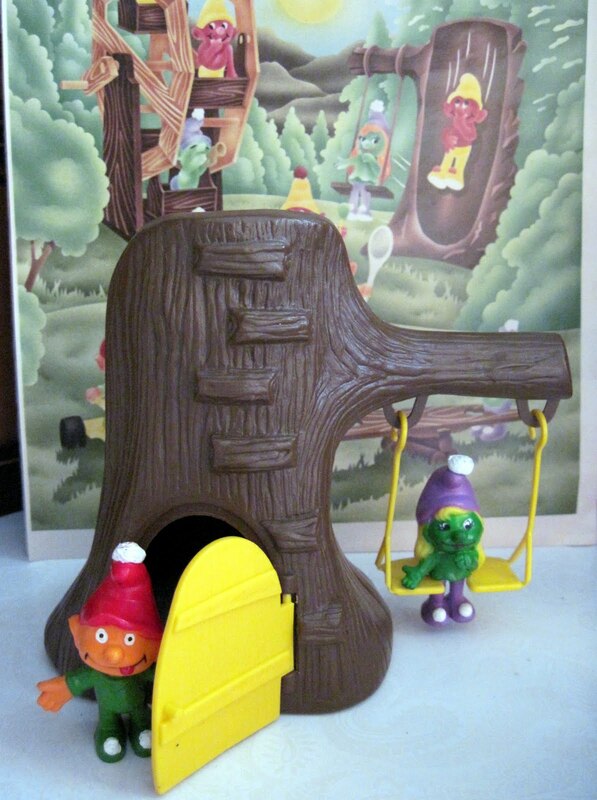 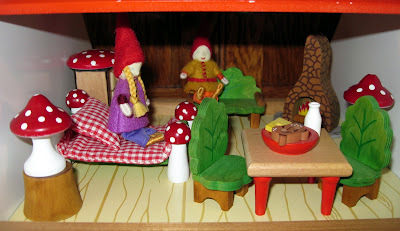 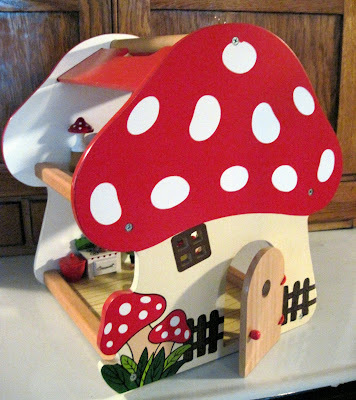 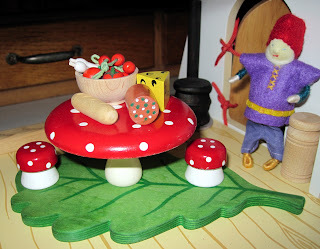 The largest piece in my collection of mushroom homes is this, a wooden mushroom dollhouse. It stands about 14 inches tall and was probably made in Germany. 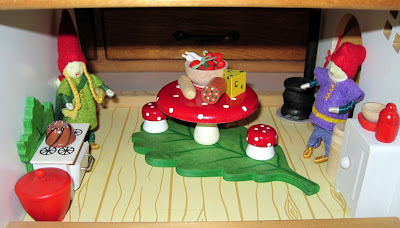 I found it years ago on display in a dollhouse shop, and I've never seen another quite like it. The house has open sides and two floors, which I've loaded up with a tiny gnome family and their furniture. 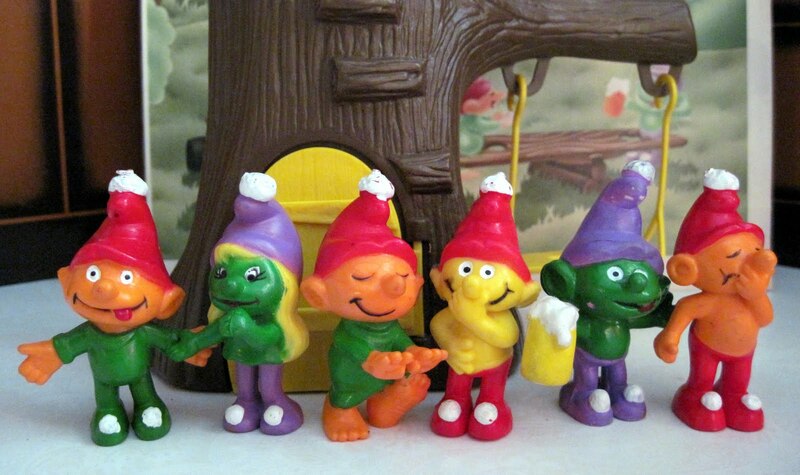 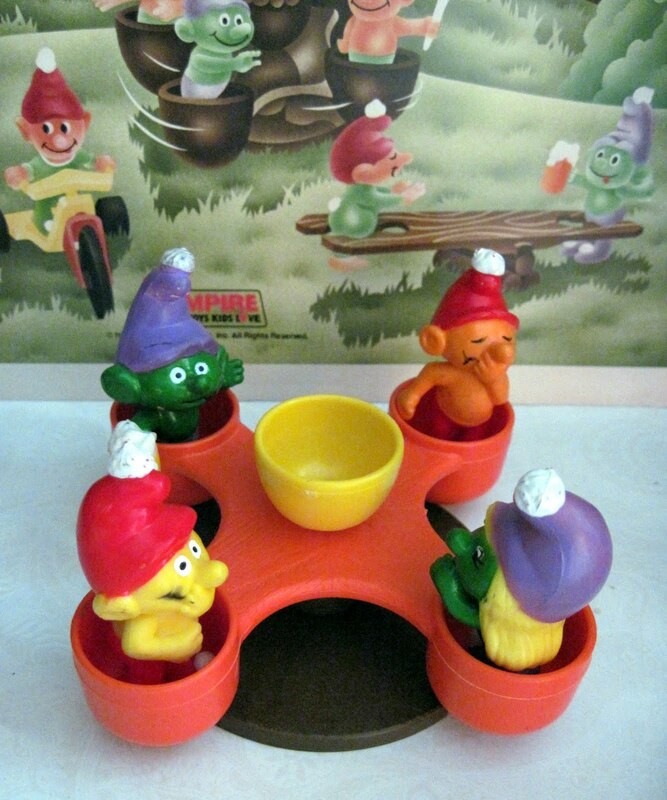 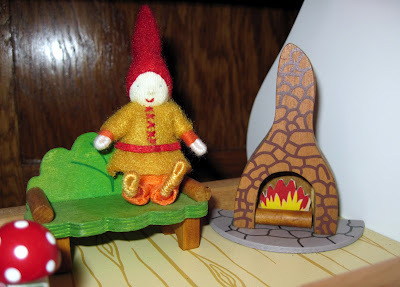 It's windy and cold here today; wish I could sit by this fire with the gnomies! 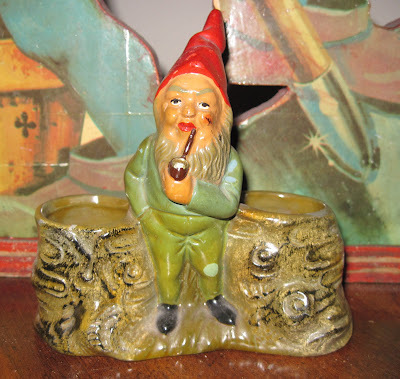 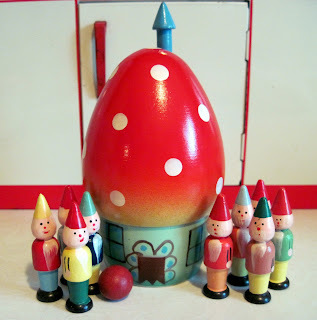 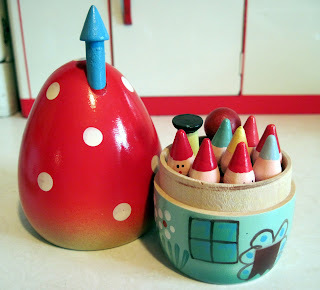 Another vintage German gnome from my collection is this ceramic piece, made in Germany circa the 1930s. 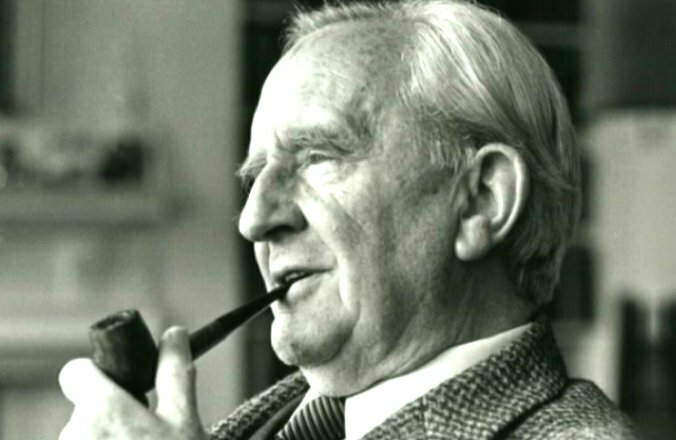 Measuring 5 inches long, the tiny, smoking gnome is flanked by two hollow "tree stumps." I'm not quite sure what purpose these served: perhaps they originally held salt and pepper shakers (I'm guessing mushroom shaped ones) or they're meant as planters for small flowers? 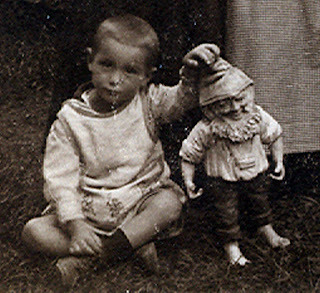 I've been wanting to do a little theme on garden gnomes for awhile (I adore gnomes), and I thought I'd start with this: a 1920s German photograph of a little boy with his gnome. 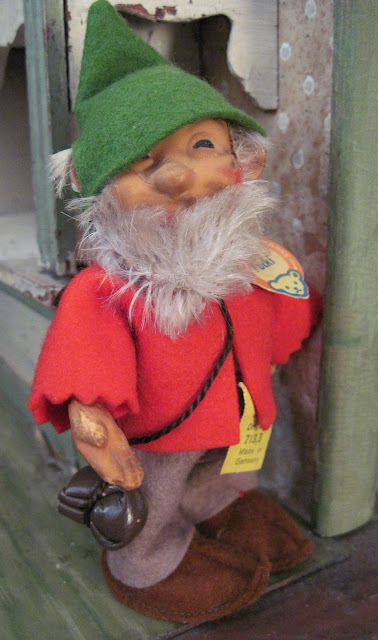 Kind of a creepy-looking gnome, no? 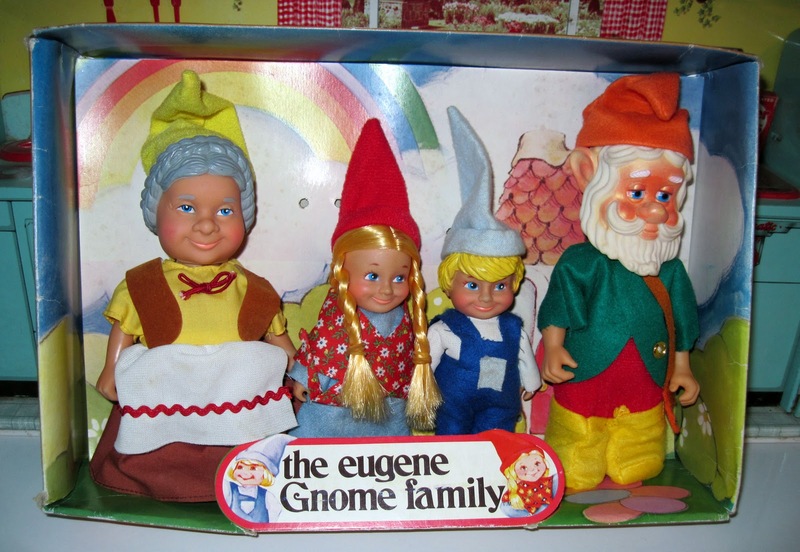 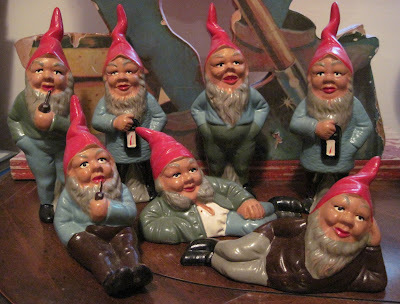 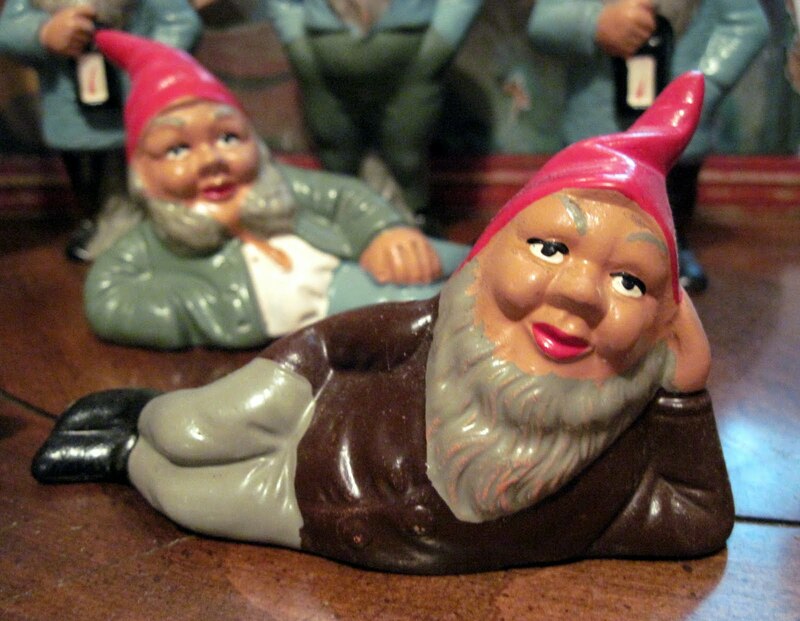 Garden gnomes got their start way back in the mid-1800s in Germany. 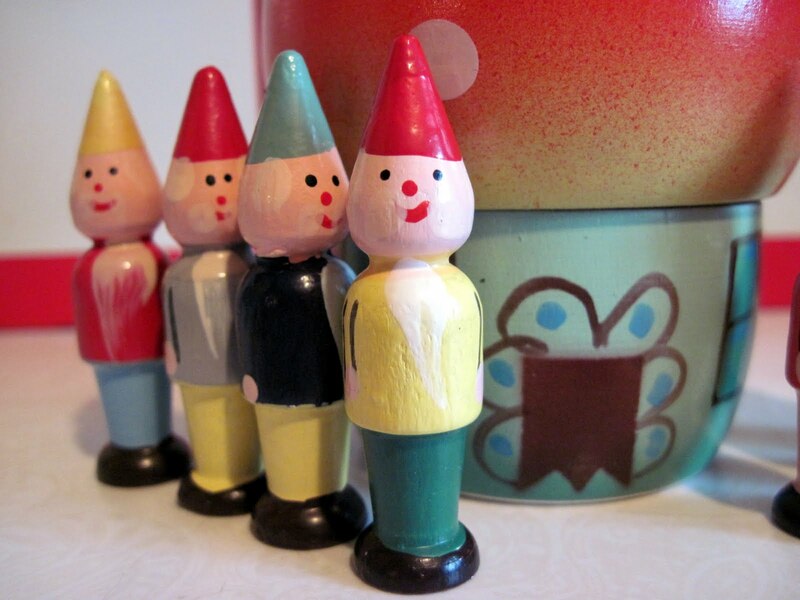 The earliest were made of terracotta and were finely sculpted. 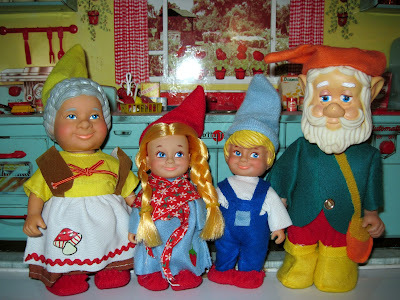 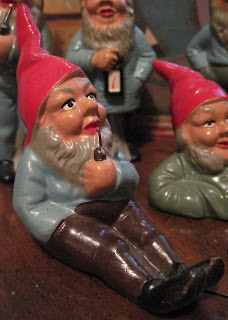 Travelers to Germany took the gnomes back to France and England, where they became very popular with hobby gardeners. In America, these ornamental figures are often referred to as lawn, not garden, gnomes, perhaps reflecting the suburbanite obsession with their little plots of grass. 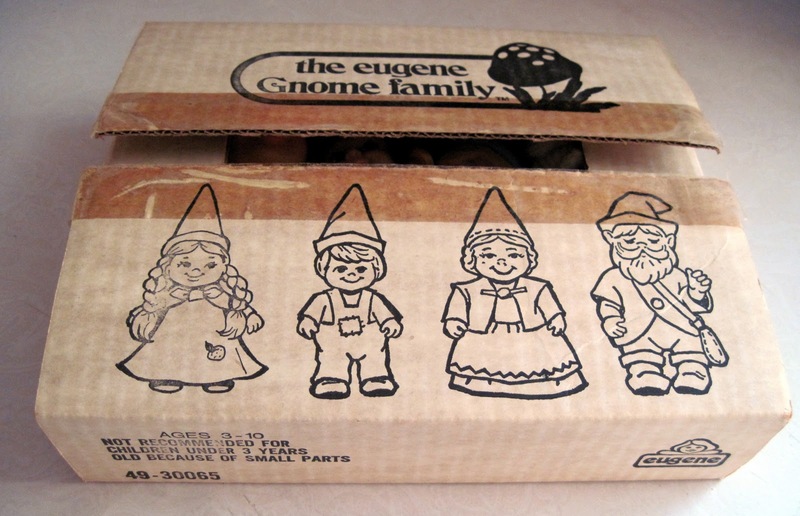 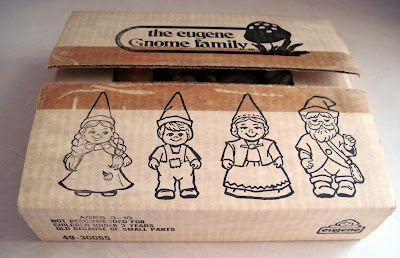 To learn more about gnomes, check out Garden Gnomes: a History, by the oddly yet aptly named garden historian Twigs Way. The yard sale and outdoor antique show season is almost over in my part of the world, where the temperatures are already dropping into the 40s (Farenheit) at night. 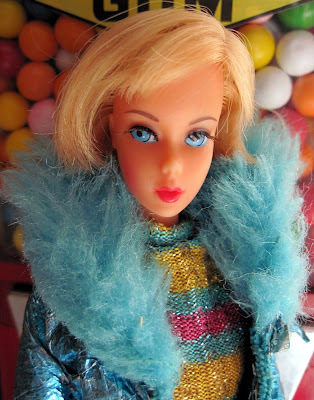 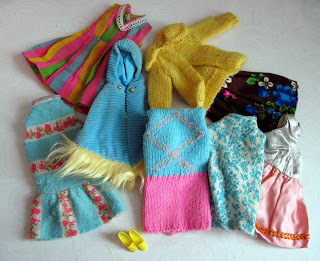 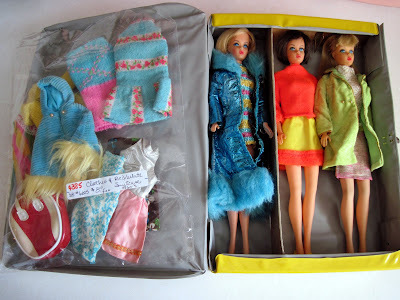 But last weekend I gathered up my spare change, braved the weather, and saled away, finding great bargains like the mod Barbie clothes and Flagg dollhouse dolls mentioned in the previous two posts. 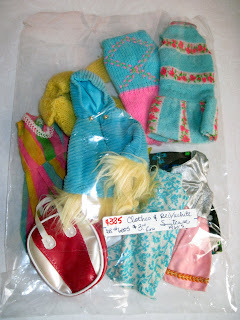 I had decided to pack it in and head home, as the weather was turning decidedly blustery, when I spotted a final sale. 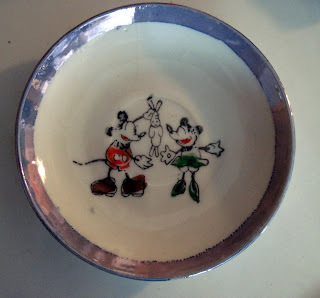 It didn't look like much, but I thought I spotted the gleam of vintage lustrewear. 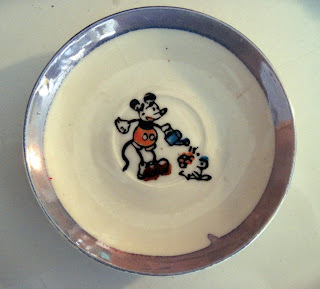 I decided to check, and good thing too, because tucked away in a corner of a table was part of a 1930s Mickey Mouse children's tea set, Made in Japan, in the rarer blue lustre variation (when found, these pieces are usually in gold lustre.) 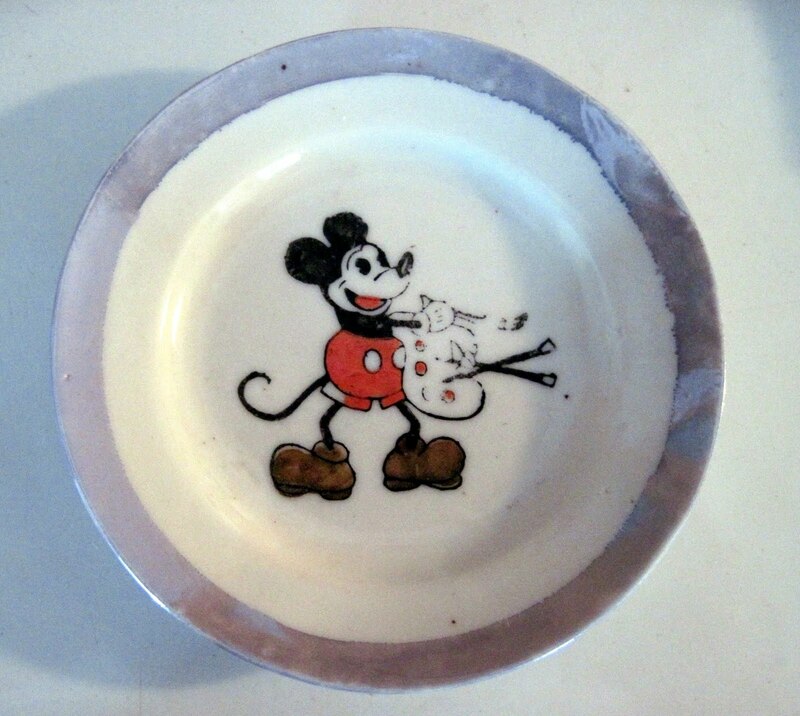 Even though it's just a partial set, it's a treasure: one of the earliest licensed Mickey Mouse items ever made! The find included a little creamer, four saucers, and two plates. For a sense of scale, the largest plates measure about 3 1/4 inches in diameter. a saucer and the creamer. An artist Mickey features in the center of a plate. from a magic hat, on this tiny saucer. My favorite piece of all was this one, a little plate with the image of Mickey standing in front of a fantastic vintage microphone. He looks so confident and self-assured, doesn't he? 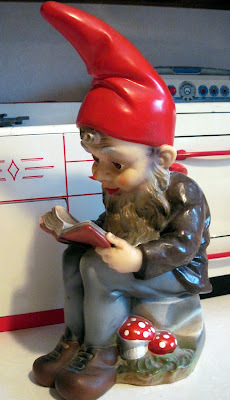 What a cute little guy. 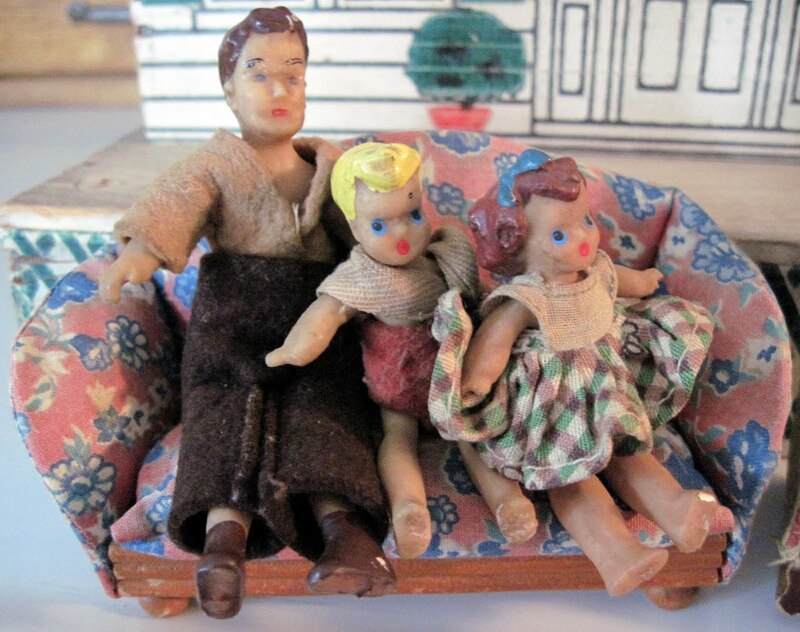 The little dollhouse family of four includes a mom and dad, just over 4 inches each, and a boy and girl, just under 3 inches. They're made of a solid, flexible vinyl over a wire armature, and feature naively handpainted features, hair, and shoes with felt and cotton clothing. The tiny dolls were made by the Flagg Doll Company in the 1950s. 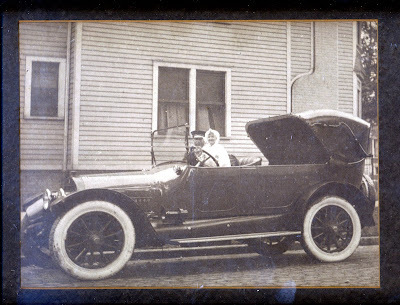 The firm began in Jamaica Plain, Massachusetts, just after WWII. 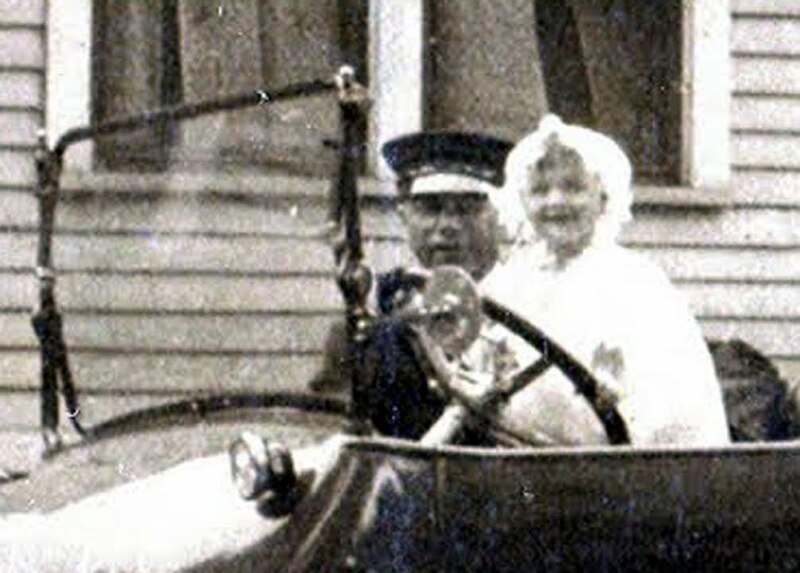 The founders, Sheila and Charles Flagg, met during the war while she worked in a factory and he served at the Navy ship yard. 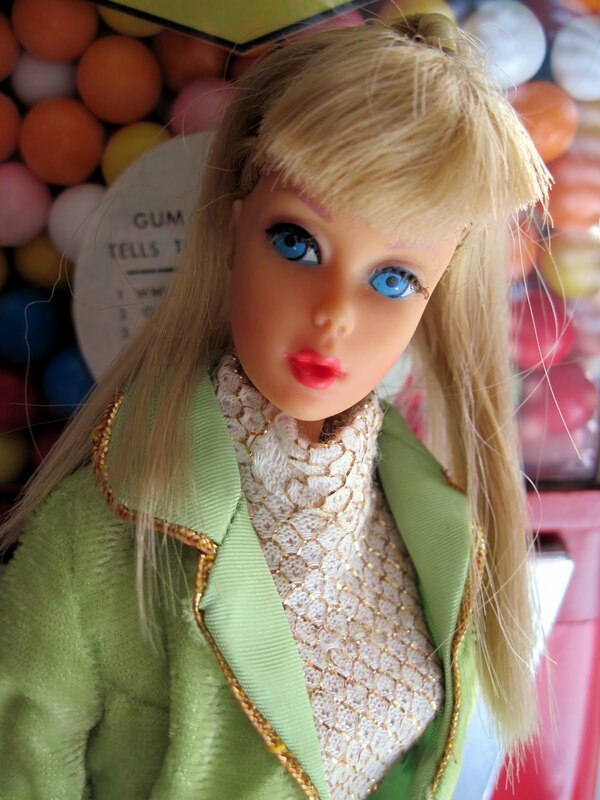 Sheila was the artistically creative side of the partnership, sculpting the dolls from soap, designing and sewing their clothes, and painting their hair and faces. Charles was the mechanically creative partner. 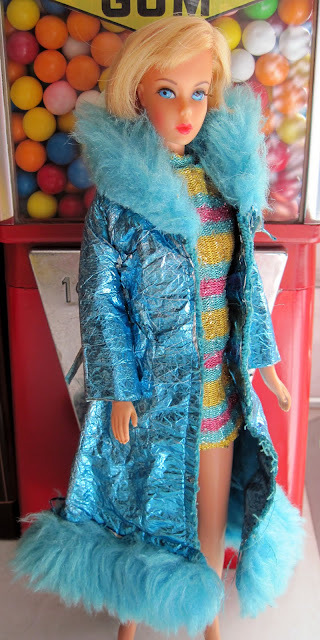 He made the molds, created the special casting oven, designed a hydraulic press to cut out the clothing, and invented a stapler to affix the clothing to the dolls. 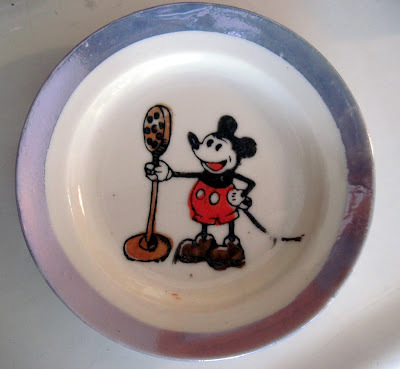 He also handled the advertising and business end of things. 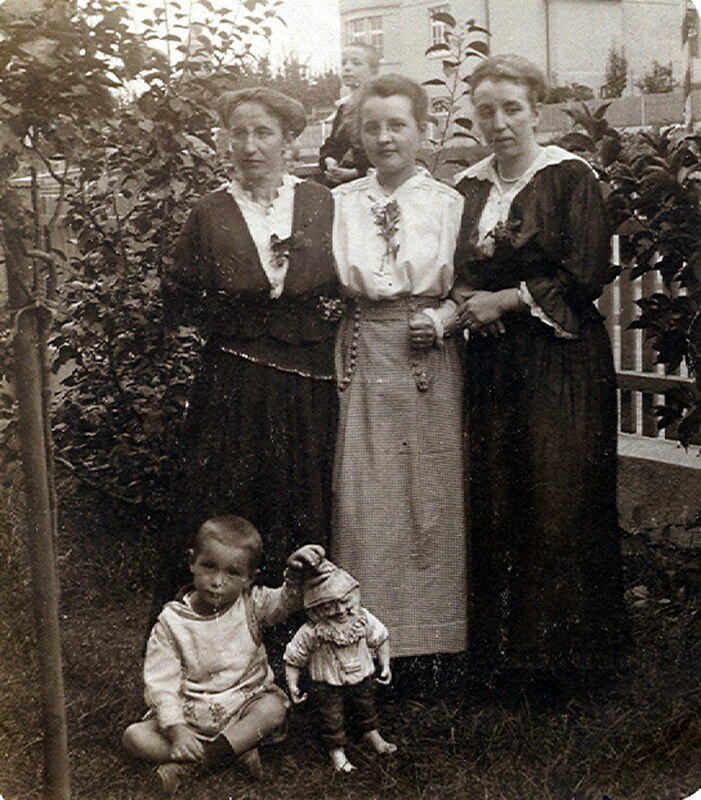 The family's children sometimes helped in the factory as well. The Tubbs report in their book that "daughters, Leslie and Penny, first painted toenails and fingernails on dolls before graduating to painting faces. 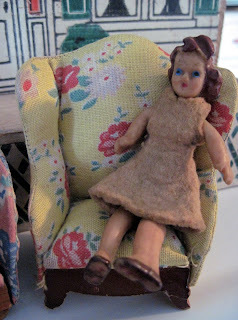 Neither daughter was allowed to be a 'costumer' after Leslie stapled her finger on the foot powered machine. 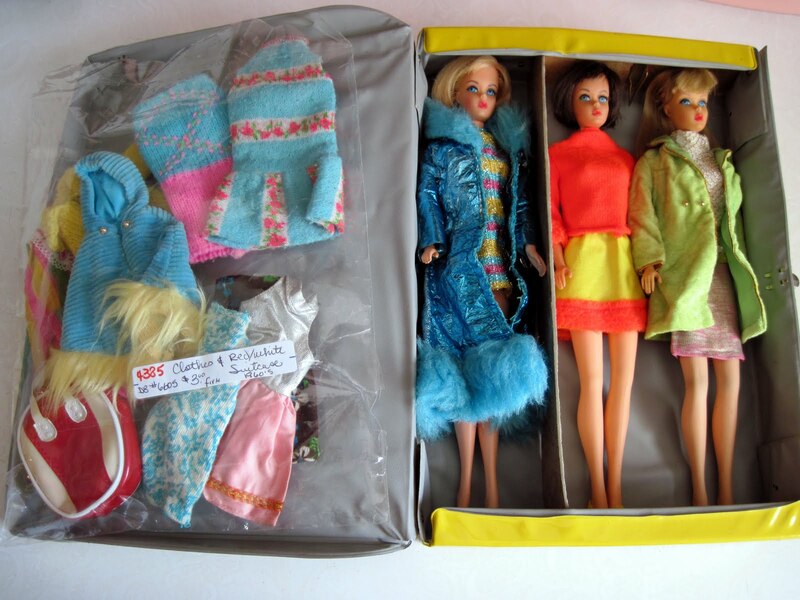 One person in the factory boxed dolls, a thankless and unpopular task, as it was difficult to place the feet in the pre-cut tab openings. The Flagg's youngest child, Charles III, was often the nominated 'boxer.'" 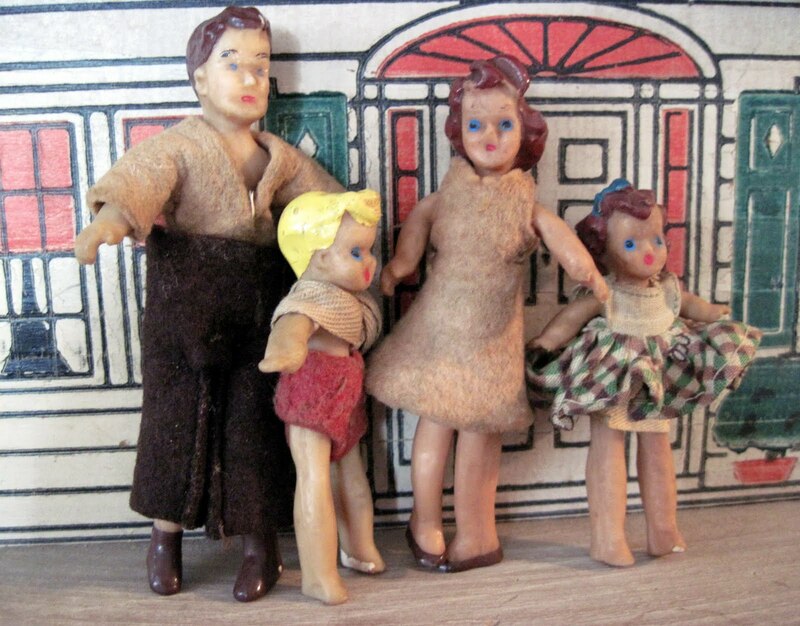 The Flagg's first dolls came out around 1947, and appealed not only to children but also to child psychologists, who used them in diagnostic play with their young patients. As dollhouse play declined in the 1970s and '80s, this clinical market became the Flagg's biggest customer. Besides the standard dollhouse family, the Flagg Company offered a vast range of creatively themed dolls, such as storybook characters, professions (nurses, doctors, police officers, teachers), a wedding party, nuns, Pilgrims, household domestic staff, and countless more. 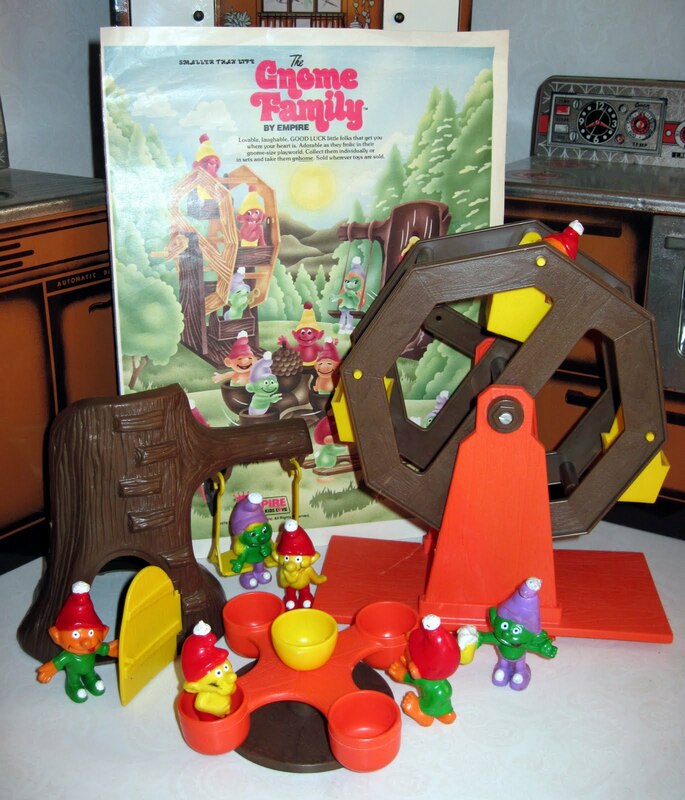 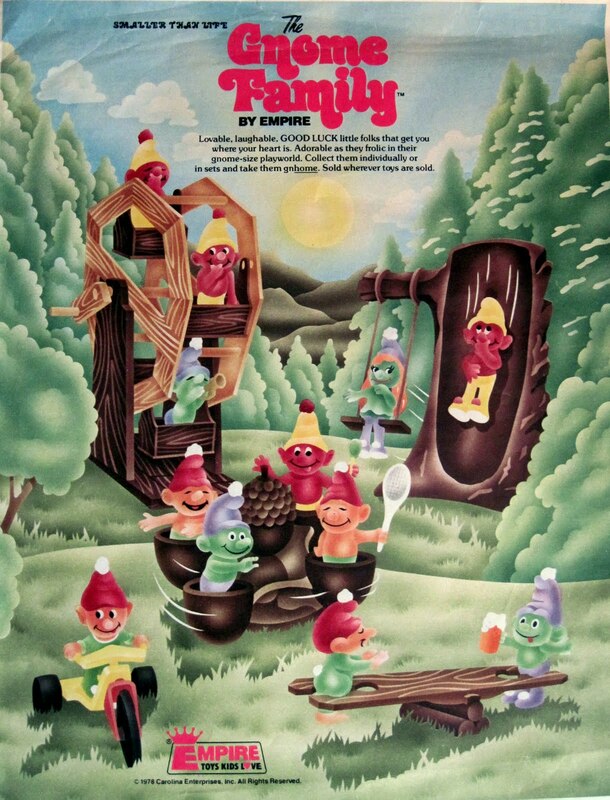 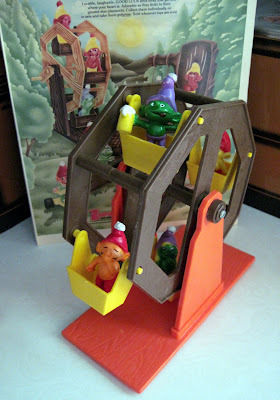 Profitability became an issue as cheap import toys began flooding the American market in the 1970s and '80s, and the company, after being sold following Charles' death, finally closed in 1985. 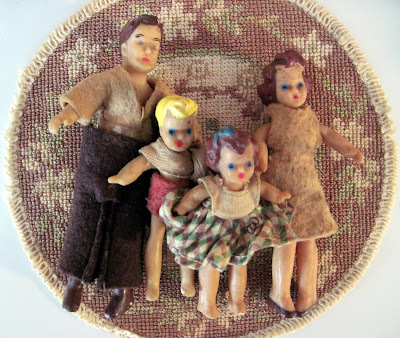 The charming little dolls, with their rich history as part of one of the last American family-owned and run toy companies, are a precious addition to any collection. 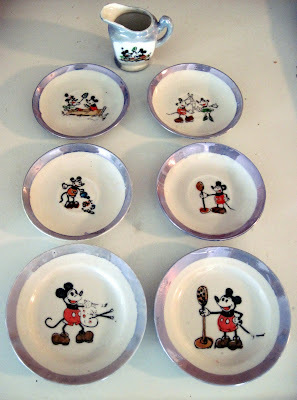 I was thrilled to find my set in a box of bargain priced "junque" at a local sale. 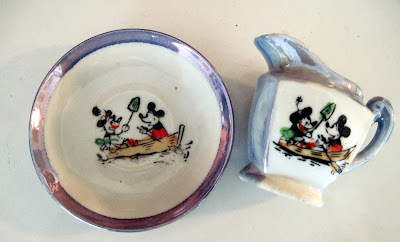 Even in their well loved and played with condition, they're still tiny treasures.